During the 2nd Reception of the Art of Stem Cells collaboration exhibition with UCI Scientists. Durante la segunda recepción para la exhibición de grupo titulada Arte de las Células Madres de los científicos de la Universidad de California, Irvine, aprenda sobre y vea muestras reales de células madres a través de microscopios. Después cree sus propios diseños usando pasteles, yeso y técnicas en óleo. Polyurethane & Acrylic Paint, 36" x 58"
The OCCCA gallery presents a SciArt exhibit in collaboration with the scientists of the Sue and Bill Gross Stem Cell Research Center at UCI. This exhibit is a unique melding of artists and scientists meeting, interviewing and touring their laboratories. Scientists and artists have always been engaged in trying to fathom the reality beyond appearances, the world invisible to our eyes. In Leonardo da Vinci’s day their was no distinction between artist and scientist. Since that time, we began to think of art as depicting nature and science as tearing it apart. Now we are witnessing the birth of a new movement in art being identified as SciArt. We see where art, science and technology have merged, blurring the boundaries on the largest of scales in which these three disciplines no longer function separately. They are less defined as a movement and more as the beginning of a whole new culture. Many artists no longer see the distinction between artist and scientists but regard themselves as researchers. 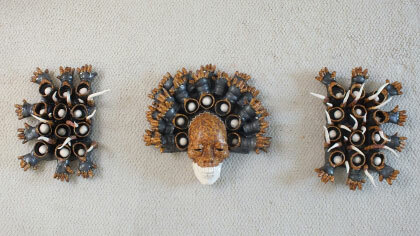 This Exhibit will be OCCCA’s 4th showing of conceptual medical art. 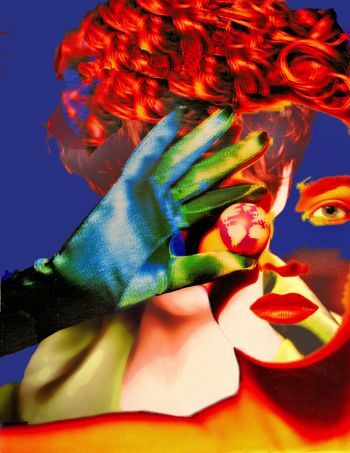 In 2005 Leslie Davis presented her show on viruses, Worlds In Collision, followed in 2007 by The Art Of Digital Imaging, a collaboration of OCCCA members with Mission Hospital for the opening of their new Imaging Building. By 2010 Leslie Davis met UCI stem cell researchers Aileen Anderson, Brian Cummings and Director, Peter Donovan. A new passion for Stem Cell research was born, which inspired the Regeneration show which delivered insight and education to the public on the great hope of Stem Cell treatment and cures. 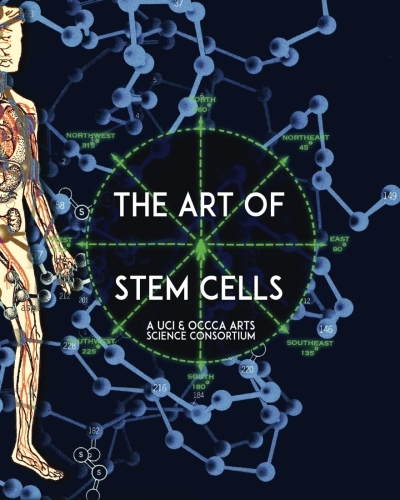 The OCCCA & UCI Collaboration of The Art Of Stem Cells is part of this growing SciArt culture where the border between artist and scientist is melting away. Artists curated by Leslie Davis and participating OCCCA members. 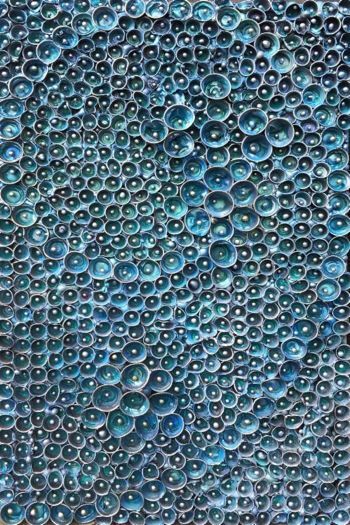 Gastrulation, Manzinita and Glass 19" x 35"
OCCCA is supporting the UCI community with it’s new The Art of Stem Cells show, opening Sept 6th thru Oct 11th. Curated by Leslie Davis, who has been deeply connected with the Sue and Bill Gross Stem Cell Center since it’s opening. This show will exhibit conceptual art about stem cell research by 34 artists. It is our intent to educate the community through visual understanding and to help dispel some of the misconceptions about stem cell research. All 22 labs will have a researcher at each opening on Sept 6th and Oct 4th. It will be a rare opportunity for the community to meet and greet with the top researchers about the state of the art for cures and treatments of Alzheimer’s , Parkinson’s, Huntington’s, Macular Degeneration, Retina Pigmatosis, Chronic Spinal Cord injury, Traumatic brain injury and Diabetes. It is our mission to extend a broader understanding and knowledge of the stem cell research that is being conducted at UCI and to bring recognition to the individual researchers that have dedicated their lives to curing and easing the pain of disease, injury and organ failure for all of us. We support UCI in their need for funding and 50% of all art sold during the show will be donated to the Sue and Bill Gross Stem Cell Center for new Research projects. UCI will be setting up our back gallery with educational video, microscopes and lab assistants to give informed information on stem cells and their use in human treatment. We will have a researcher from each of the 22 labs attending the openings on Sept 6th and Oct 4th. They will be accompanied by the artists to express how their art work gives an educational- visual perspective on their work. We are dedicating this show to the recent director, Dr. Peter Donovan. It was his vision and guiding force over the past 8 years to bring the Stem Cell Center into reality. It is a unique center in that research and patient treatment is under the same roof. His fund raising and world wide search for top scientists that shared his philosophy of collaborating their research with each other, thus speeding the goal to human study and treatment. He is now back in the lab on his newest NIH grant to study how to correct mutated genes in the very first 15 divisions of life. 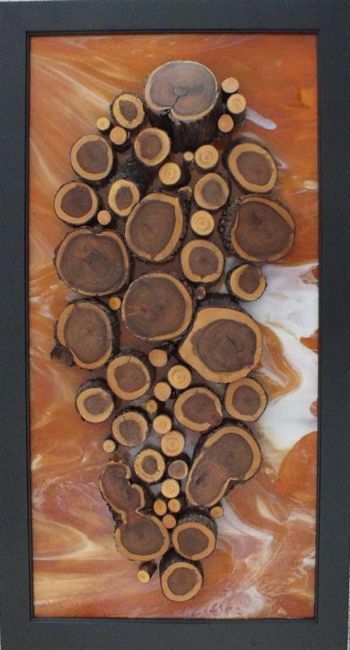 Gregg Stone, Carpal Capellini, Ceramic & Glaze, 14" x 14"
We call them stem cells because they are the base from which other important cells spring, like the branches, leaves and flowers of a plant spring from its roots and stem. Every person, child and adult, has stem cells working all the time to renew and repair tissues and organs. These are “adult” or “tissue specific” stem cells, such as the stem cells of our bone marrow that are working all the time to make red and white blood cells to meet the body’s needs. We have also learned how to use a more all purpose stem cell, the “pluripotent” stem cell that can make almost any cell type. Pluripotent cells are very exciting as we can use them to study and hopefully repair all kinds of tissues damaged by disease or injury. We can take a pluripotent stem cell and teach it to become a nerve cell to treat spinal cord injury or Alzheimer’s Disease, or coax it into becoming a cell of the retina of the eye to treat blinding diseases, or push it to become an insulin producing cell of the pancreas in order to treat diabetes. Stem cells can also help us study disease and test new drugs for toxicity or efficacy. The science of stem cells is new and exciting. To the scientists, stem cells have a special kind of beauty – the beauty of opportunity to learn and to heal. The Sue & Bill Gross Stem Cell Research Center. paddles and balls, Ping-Pong table covered in gold leaf, 2 DVDs. 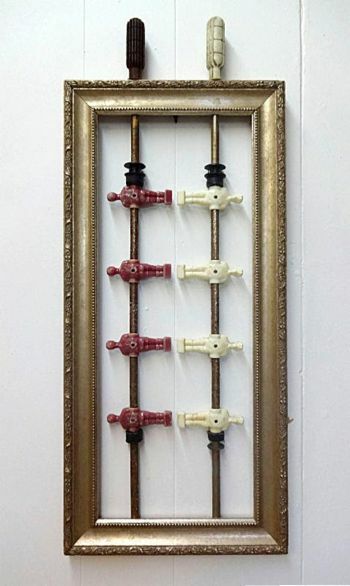 Wood frame, foosball players, 2014, 33" x 13 3/4" x 1 1/2"